School textbooks contain a series of ‘proofs’ for evolution that have all been debunked – yet they continue to be published as fact. Did You know that the evidence for evolution that is still taught in biology classes today is based on out-of-date science, and even hoaxes? The study of evolution has been compulsory in GCSE and ‘A’ level studies for many years, and so most people with a scientific secondary education or above are familiar with the more popular ‘proofs’ of evolution. They’ve occupied textbooks for decades. They include: the Miller-Urey attempt to recreate the chemicals for life; the tree of life with its implied common ancestor for all life forms; similar structures (homology); ‘gill slits’ in human embryos; the peppered moth story of natural selection; and the ‘dinosaur-bird’ Archaeopteryx. But they’re all discredited. Some are actually fraudulent while others are, at best, misleading. And evolutionists know it. Yet they are apparently quite happy for text books to continue promoting such deception. The tree of life is ubiquitous in evolutionary literature. The idea that all of life is descended from a single common ancestor billions of years ago is how many would define evolution. But the actual evidence argues strongly against any such single common ancestor, and most animal life forms appear suddenly without ancestors in what is known as the Cambrian explosion of nearly 543 million years ago, according to evolutionary dating. The Cambrian rocks contain such a huge variety of fossils that evolution would need hundreds of millions of years to create such diversity. But evolutionists’ own estimates suggest all this change took place in less than 5-10 million years – and they are at a loss to explain it. Yet the tree of life, showing slow gradual changes, remains. Another critical evidence for evolution is homologous or similar structures. For example, the forelimbs of all mammals, from bats to whales to horses to humans, possess the same basic bone structure. This is routinely hailed as evidence that these structures descended from a common ancestor. The differences between bats and whales simply demonstrates different adaptive stories, but the limb structures are basically the same. But there is a circular argument going on here. Homology is the theory used to explain why some structures have the same design – they all arose from a common ancestor. It’s an assumption with no proof. But then homology itself is used as an evidence of evolution. How can an unproven theory be used as evidence?! Yet textbooks continue to perpetuate this myth that has been exposed for decades. Perhaps the most inexcusable ‘proof’ of all is the idea that the development of embryos reveals the history of their evolution. Originally pointed out by Ernst Haeckel in the 19th century, and used by Darwin in ‘On the Origin of Species’, it seemed like a powerful argument. Haeckel believed that vertebrate embryos pass through a remarkably similar stage early in development and only later diverge to the specific form. This was seen as evidence for a common ancestor. And human embryos were said to show how we have evolved from fish because of so-called ‘gill slits’ in our embryos. The only problem is that Haeckel’s embryo drawings were a hoax. And this has been known for over a hundred years! Embryologists have long admitted that Haeckel ‘adapted’ the evidence. Vertebrate embryos never pass through a similar stage, and human embryos don’t have ‘gills’. What’s more, Haeckel left out the fact that embryos pass through remarkably different pathways to arrive at the supposedly similar intermediate stage. The fraud was only ‘rediscovered’ and acknowledged by the wider scientific community in1997, though embryologists had known about it for years. This shows the lengths to which supposedly impartial scientists are prepared to go to defend evolution. This purports to show that molecules necessary for life could have arisen by simple chemical reactions on an early earth. 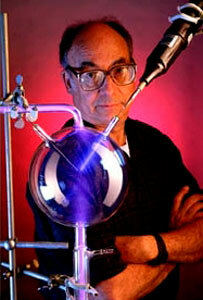 The Miller-Urey experiment uses an atmosphere of reduced gases: ammonia, methane, water vapour and hydrogen. Then it adds some energy in the form of sparks, and produces, as Carl Sagan once said, “the stuff of life”. This experiment dates back to 1953, but for the last 20 or 30 years origin of life researchers have realised that this atmosphere does not reflect that of the early earth. Many textbooks will begrudgingly admit this, but include the experiment anyway. The reason: no other simulated atmosphere works. It seems that the textbook writers believe that since they ‘know’ evolution happened somehow, they don’t have to represent the facts accurately! In any case, the experiment ends up with both ‘right-handed’ and ‘left-handed’ amino acids, whereas life forms only have the ‘left-handed’ variety. In 1840s industrial England, a dark or melanic form of the peppered moth was increasing in numbers. By 1900, the dark form comprised as much as 90% of some groups of the moth. In the 1950s, experiments by Bernard Kettlewell showed that this change from the light, spotted or ‘peppered’ variety to the dark moth was due to environmental factors. The surface of tree trunks had changed from a splotchy, lichen-covered bark to a mostly dark colour due to pollution. Deposits from smog and smoke had killed the lichens and covered the bark with soot. So the lighter moths, resting on the trees, were more easily spotted by birds hunting for their breakfast, and declined. The trees now provided better camouflage for the darker moths, so they grew in number. This story was hailed a legendary example of evolution. But within 20 years of Kettlewell’s work, cracks began to appear. As stricter air quality standards returned in later years, the lichens returned and the peppered variety began to dominate again. But the theory really unravelled when it was observed that moths of both varieties never rest on tree trunks in normal life! Moths are not active during daylight, so how could birds find them on tree trunks? All the photographs of moths on trees had been staged by Kettlewell. He released his moths near to trees in daylight hours, when the moths are naturally inactive. They simply found the nearest resting place to go back to sleep and the birds gobbled up the non-camouflaged moths. Yet many biologists continue to insist that it shows evolution in action. “To explain the complexities would only confuse students,” they say! The truth is that even schoolkids would see the holes in the theory. The reptile-like bird, Archaeopteryx, is probably the most famous ‘missing link’. 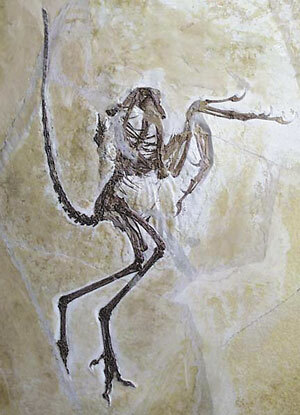 This German fossil is of a reptilian skeleton with wings and feathers – a link between dinosaurs and birds – an evolutionist’s dream! But as happens with so many missing links or transitionary fossils, later research undermines the concept. It is now universally viewed as just an extinct bird, but still evolutionists claim it was an early offshoot of the real ancestor. And what of more recent bird-like dinosaur finds? Curiously, many come from much later geologic periods than ‘Archy’ yet are still hailed as ancestors! This is based on structural similarities, despite their existence after Archaeopteryx. Never mind that the child exists before the parent. But anyone who objects is just accused of oversimplifying things. In 1999, ‘National Geographic’ was embarrassed to find that a Chinese dinosaur/bird fossil they publicised turned out to be a fake – it was two fossils glued together! Yet the magazine had asked evolutionists to verify it before they went into print. But those same evolutionists had the cheek to claim that the two halves still represented evolutionary progression. Such is the power of wanting to believe your theory is true! Darwin’s finches… horse evolution… mutant four-winged fruit flies… and the classic diagram showing ape-like creatures evolving into full human beings. All these ‘proofs’ turn out to be far less than what the textbooks suggest. Textbook writers are either ignorant of the later research, which makes you sceptical of the accuracy of the rest of the book, or they are intentionally misrepresenting the evidence to pretend that there is a water-tight case for evolution. Read more articles like this in The Delusion of Evolution. Very good read! good to see truth in print!!! This is a fascinating magazine and I just wish there was more volumes so I could continue learning about the design vs evolution debate. Well put together and with some compelling arguments.